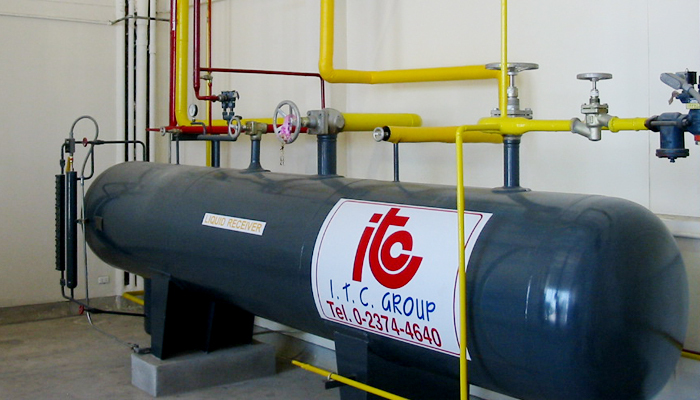 High Pressure Liquid receiver designed by "I.T.C." follows the ASME section VIII Division 1 requirement as guideline. All models are fabricated out of A516-Gr70 Steel sheet (ASTM standard) submerged arc welded along body and head seams. Pressure tests at 31 bar(g) By hydroStatic. Standard accessories include dual safety relief valve purge at 20.6 bar(g) and liquid level glass. Optional liquid indicators are available e.g. flip flap tpye level control, or Electrode tpye liquid level transducer. The ITC’s Pressure Vessel Liquid Receiver model “HPRH” following the guidelines of ASME section VIII Division1 is a specialized liquid ammonia reservoir which can handle high pressure liquid. A fabricated A516-Gr70 steel sheet (ASTM standard) passing through the process of submerged arc welding along the body’s and head’s seams can ensure its durability. This also can prevent the liquid ammonia from leaking out. The reservoir always set the hydrostatic pressure in the internal structure to be at 31 bars (g). High Pressure Liquid receiver designed by ITC follows the ASME section VIIl Division 1 requirements. All models are fabricated from A516-Gr70 Steel sheet (ASTM standard), and run through a submerged arc welding process along its body and head. Also, we have tested it at 31 Bars (g) by hydrostatic. Standard accessories include dual safety relief valve purge at 20.7 Bars (g) and liquid level glass. Optional liquid indicators are also available e.g. fiip flap type level control and electrode type liquid level transducer.